The idea is to keep it simple. Like so many things, that takes a bit of planning. The key thing is to use the weight of the SIP (about 40 lbs for the 2-bucket design) to anchor something that you fasten poles to. Angled braces keep them from tipping over. I've spent the last three Friday mornings building a simple set of trellises for about 100 2-bucket SIPs on the rooftop of the Pacific Garden Mission. After setting a post at either end--and at each of the corners--of what viewed from above looks like a giant question mark, we used a variation of the Florida Weave to support the tomatoes, squash and cucumbers. Each post, nothing more that a scavenged piece of 2"x4", was attached at the bottom to a 4 foot long piece of salvaged 2x10 deck joist. 1x4 angled braces were placed to prevent the post from tipping over. To keep it all in place, 2 or 3 planted SIPs were set on each 2x10 plank. 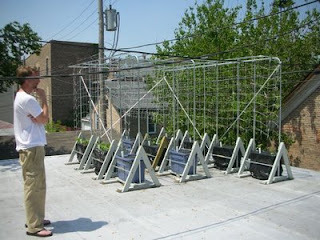 My rooftop garden has an overbuilt, industrial strength trellis, made of electrical pipe and 2x4's. I was worried about a tall plant catching the wind and blowing the entire thing off the edge of my roof. Now I think all that piping is overkill. Also, I could have eliminated all the "A" frames next to all the SIPs in the middle of the grid. If I were starting from scratch, I'd make something like what I did at PGM. It's so much easier--cheaper too--and works almost as well. A downside to the Florida Weave is that you need to add a horizontal run of twine every 8-10 inches, following the plant up as it grows. Also it's only good for one season. What I did on my roof is more permanent and works year after year. Art (Mr. H2) had another idea, one that worked well with all their 2-bucket SIPs. He used several of the green metal grids he bought years ago at an industrial auction. If you did the same, here's your chance to put them to work. 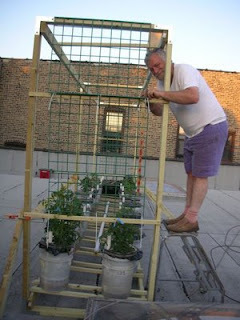 For more good trellis ideas, check out this Fine Gardening article. Good luck making your own! 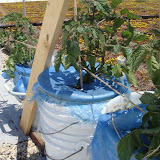 I use a variation of the "square wooden cage" for my Earthbox roof garden. Looking good, Bruce. I went up to the roof to scope out phase one of the trellis project but haven't been back to PGM since. Much progress! It's a pretty sterile environment up on that roof isn't it. Though hard to beat the view. Wouldn't it be amazing to see the same plant density/variety on the roof that's down in the nursery? My name is kendle, and Im a student from the University of Puget Sound in Tacoma, WA. 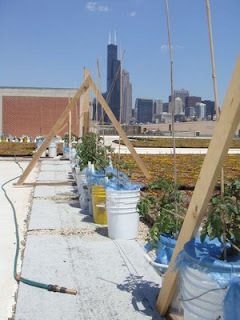 I'm in Chicago for the month of june researching Urban Agriculture, and would love to interview one or all of you about rooftop gardening in the city! I can't find contact information on the blog, so I hope you will get in touch with me! Send us an email - greenroofgrowers [at] gmail [dot] com and we'll go from there. Oh, completely. Maybe someday we will be able to farm baby lettuces ... and figs, and fish! ... up there as well. Addendum: we may be getting there, slowly. Yesterday Robert and I planted watermelon straight into the rooftop sedum. We'll see how it does. 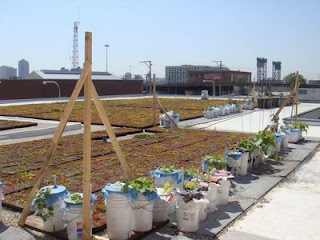 It's inspiring to see posts regarding green roofs. I'm planning to reconstruct our rooftop with my wife. We're both in love with growing plants and we thought that it would be great to have them on top of our house. We're waiting roofing contractors (Omaha) if there are any suggestions they could provide for our project. I hope to see more of your posts and tips. If you're going to be using timber then always treat it with the best wood preservative. It will save you a lot a hassle in the long term.